49 community members from Orakzai and North Waziristan districts attended 7 days training on “Fruit and Forest Nursery Raising” in Agriculture Research Institute (ARI), Swat. The training was focused on nursery raising, plant health, plant propagation method, nursery management, registration and plant marketing. 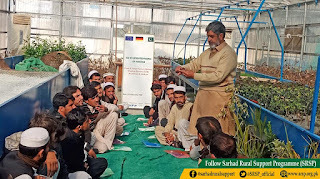 Certificates were distributed among successful participants and gifted 50 strawberry plants to the each participant on the completion. The training was conducted under “Aid to Uprooted People (AUP)” project which is funded by the European Union, financed by KFW and implemented by SRSP to support the recently returned families of five newly merged districts of Khyber Pakhtunkhwa. 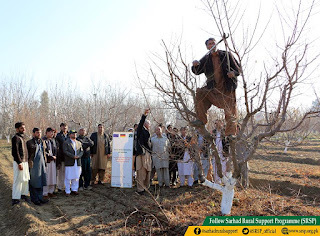 Under the afore-mentioned project, over 4,000 community members will be trained in different trades in the newly merged districts with an aim to enhance their socio-economic situation.